Coin Purse with String - 4" x 3.75". Multicolored. Set of 6. Colorful and durable. Manta blankets are traditionally used by the native women of the Andes to carry babies and harvests strapped to their backs. Here, we use scraps of the woven cotton fabric to create accessory items like this coin purse. The little pouch has a velcro closure and a string so it can be hung around the neck. They are Fair Trade from Peru and help cottage industries there. There are carved gourds, instruments, pottery, bags, purses, textiles, worry dolls and more. 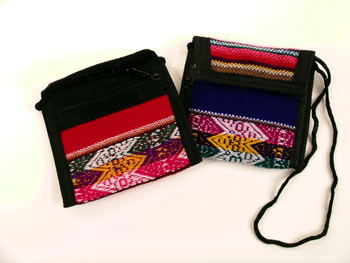 See Repped Products section for other Andes Fair Trade Items. This line has a minimum of $100 and cannot be combined with the Light Stones products for the minimum.